Pedal Powering your next event taps you into the magic of community power, the cleanest and best source of power currently available. Nearly a thousand packed in to a Mission District street closure to take in a free Pedal Powered show at Bicycle Music Festival. On stage: Quinn Deveaux. The show was powered by 14 fans. 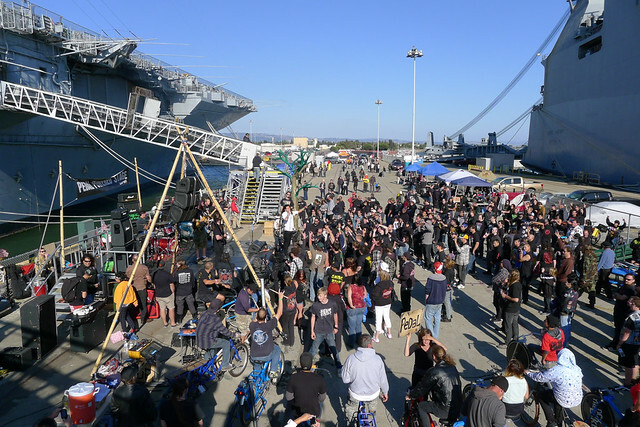 Above: With our new aerial rigging and JBL VRX Line Array drivers, we can entertain a crowd of 2000-3000 in a space several hundred feet deep. This performance was powered by 20 people. 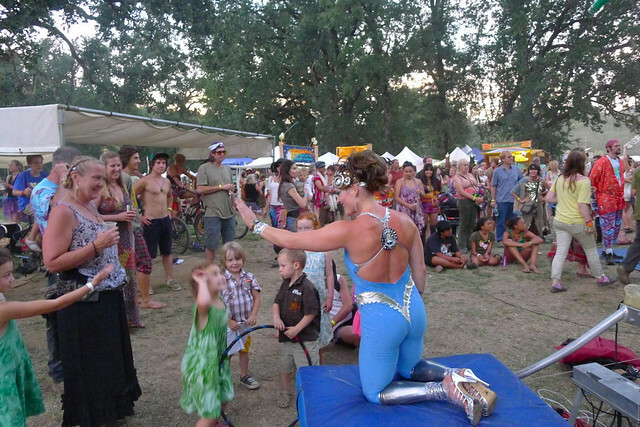 Above: a mother and son bonding in the Pedal Power area at the Oregon Country Fair. World class Audio Gear. We bring a complete audio package including mics, stands, loudspeakers, cables, mixers, outboard gear, monitors, 1000-watt subwoofers, etc. It’s sufficient for audiences up to 3,000 and bands with up to 8 members. *New for 2013* Aerially rigged VRX Line Array speakers! All of our PA speakers have been specially modified to run directly from bike power. 40% more efficient and super inspiring. Efficient, comfortable Bicycle Generators. Our generators are stable, safe, and colorful, and fit a wide variety of people, from adult men to 7-year-old kids. We make sure to bring enough generators that pedal power feels moderately challenging–everyday people can contribute. Our roadies become ringer pedalers who can boost power levels as needed. Coaching. Our crew includes outgoing pedal coaches who pull in your audience and motivate them to contribute. Our 8′ tall Pedalometers (power indicators ) show pedalers exactly how hard to pedal. Sound Guy/Girl. Our crew experienced audio technicians who optimize the available pedal power for the most clean, clear sound. Transportation. 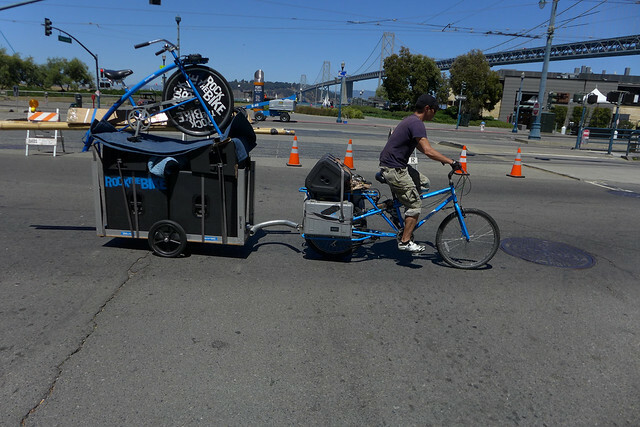 Our roadies transport all our gear to and from your event on cargo bikes, reducing the impact of cars and trucks. For out of town events we use pickup trucks. Education. We display the power generated by the pedalers, and track the consumption of our equipment and update the crowd throughout the event to maximize the educational potential of the activity. If appropriate, we provide a science lesson that satisfies your audience’s curiosity about how our system works. Promotion. Our gear-hauling rides are social, and serve to promote your event as we hand out fliers and play the songs of your featured artists en route. We also utilize our e-communication outlets to promote your Pedal Powered event. We do not provide an elevated stage for your event. Read a full explanation of Pedal Powered concert dynamics, with answers to the most common questions: How does it work? Who pedals? How do you avoid power outages? Why are you doing this? Ready to Start? Submit Your Event! Also, you can read testimonials from our clients. Want to see photos from our events? Check out the latest shots from our Pedal Powered Stage events. We update it after almost every event! Also check us out on Facebook. Want to get a taste of a Pedal Powered Stage event? Click play below for highlights from Rupa and the April Fishes’ set at the 2012 Bicycle Music Festival. Rupa & The April Fishes – Bicycle Music Festival 2012 from janel sterbentz on Vimeo. Pedal power is an ice-breaking, fresh social activity that connects strangers in an electrifying way: working shoulder to shoulder, rocking the party as a team. 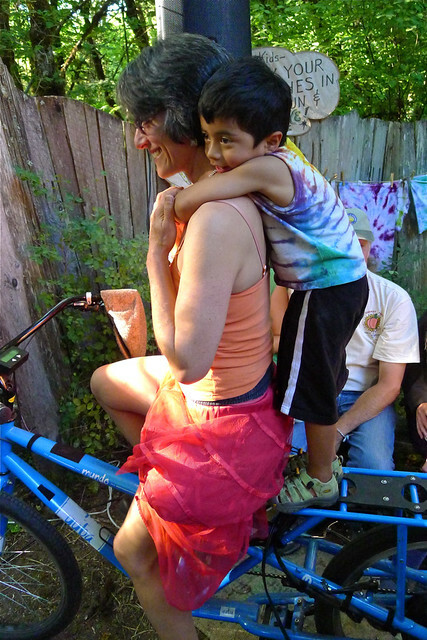 When it’s time for the dancing spirit to bust loose, pedal power’s movement gets people moving. Only a hands-on (and feet-on) experience this cool can transform what might have been a merely excellent event into a soul-moving, year-making event. Above: our Wattage Display shows how much energy has been generated (and used) by pedalers. We are committed to creating experiences where learning about power is fun and social, not guilt-ridden. Our displays and crew are able to help participants reach personal realizations about power consumption. Power is not free. It has to come from somewhere. 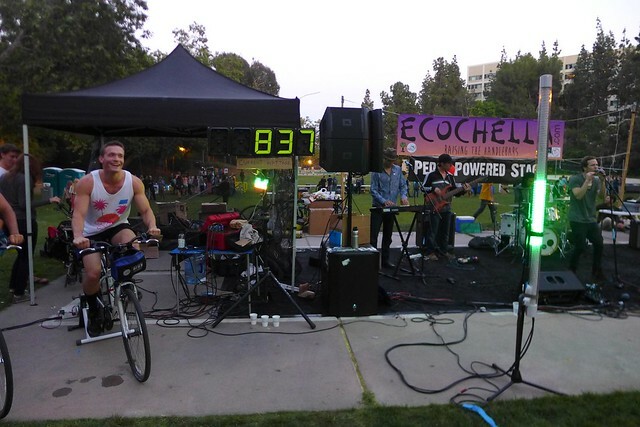 The Pedal Powered Stage is an uplifting and effective way to make that knowledge spread. Musicians and Audiences Rise to the Occasion. We can power many styles of music, including heavy metals bands. Bring us to your event and we can power your DJ/band’s needs. Bands love playing through Pedal Power because the audience is already moving at the beginning of their set. 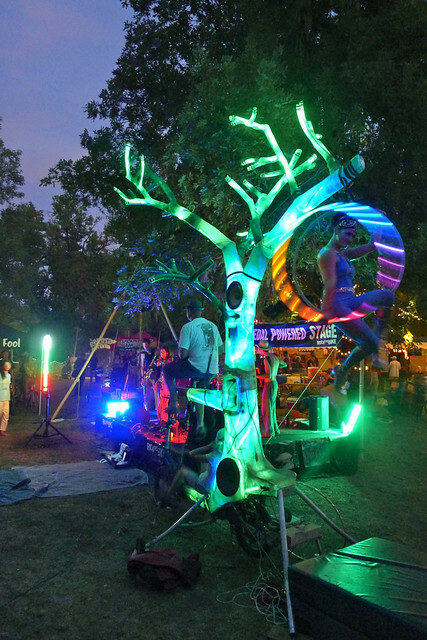 Our Pedal Powered Stage fleet includes the legendary Bike Tree, El Arbol, seen above, as well as the Blue Whale and the Choprical Fish. 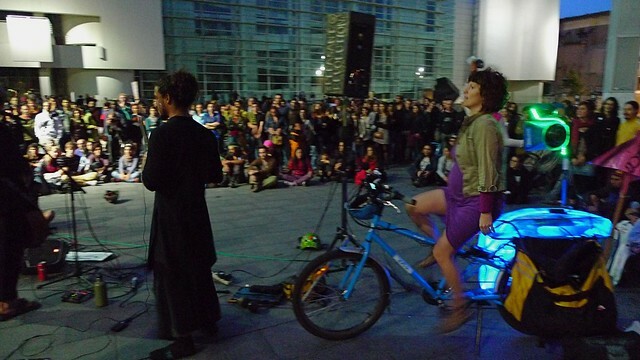 An expecting woman Pedal Powers a rock show at Barcelona Bicycle Music Festival on the Blue Whale. Our fleet of cargo and custom party bikes are complete with on-board neon lights, bumping sound system, and pedal-power capabilities. It can immediately start cranking out tunes as we set up our stage, which usually takes about an hour. Biked-in sound = quick deployment and unusual locations. Above: Nio tows two subs, two VRXs, a 612 Monitor, a mic case, pedalometer, Electric Fender Blender Pro, no battery. Turn the heads of everybody at your event as we magically arrive on cargo bikes loaded with sound equipment, set those same bikes up to power the sound system, then load the bikes back up and vanish, all without consuming any fossil fuels. The fact that we bike the bike, not just talk the talk, inspires participants at your event. When you don’t need electrical outlets, the whole world becomes a stage! Want to rock the floor of a trade show or a big concert in a city park without lobbying the powers-that-be for permission to plug into an outlet? Want to have your wedding at the end of that pier? 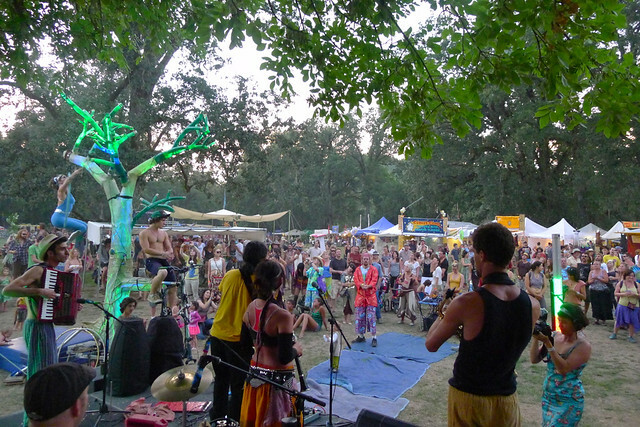 Want to rock a concert at the beach, amidst the redwoods, in a wildflower-speckled meadow, on the school playground, on the steps of city hall, or even in-motion with a “live on-bike” performance? With pedal-power, that power is in your hands (and feet)! The Pedal Powered stage amplifies your press coverage! An event with a remarkable sound system gets remarked on by the press, and we’ve proven that pedal power provides that ‘unimpeachably cool-factor’ that catches their ears and turns their gears every time. Stretch your marketing dollar! Let your investment in the sound system work for you twice: onstage and off! Rock the Bike will help your PR effort with multimedia tools: videos, web, photos, tech info, and more. Pro Audio Sound from Names you Trust. – Shure wired and wireless microphones. 10 mics available in total including Shure Beta 58 vocal mic and Beta 91a kick mic. Even those with the pickiest ears — musicians themselves– rave about the clarity and commanding presence of our system. 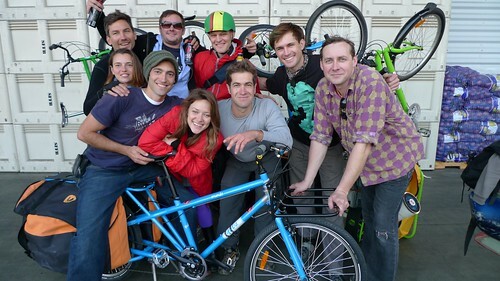 Each year at the SF Bicycle Music Festival we use the Rock the Bike system to amplify 15 different bands ranging in tone from salsa bands with full horn sections, to whispering singer-songwriters accompanied by a ukulele, and broadcast it to hundreds of sonically-spoiled city dwellers in a challenging outdoor urban setting. And every year, we get the party moving with pedal power. Compromise on Volume, Not Sound Quality. The clipping is right. Raw decibels aren’t the only way to measure the effect of the amplified music at your event. Most music fans want the clarity and presence that comes from using professional quality gear, but they can do without the ringing sound in their ears when they’re heading home from an event. With a modular system capable of producing anywhere between 75 – 2000 watts, Rock the Bike makes sure that the volume is exactly what you need: no more, no less. 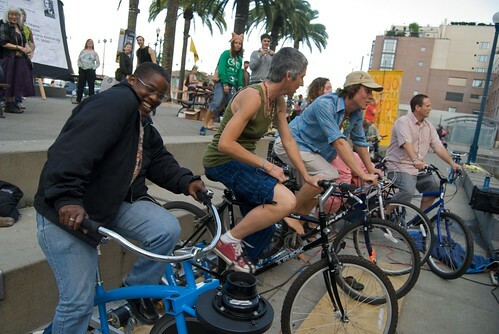 With 53% of adult Californians and 22% of children considered medically obese, and many more people of all shapes suffering from respiratory disease from polluted air, immersing your audience in the magic of bike-culture with the pedal powered stage couldn’t be a more considerate or timely gesture. Healthy habits gain momentum when friends can move in that direction together. We’re all about getting your audience interested in bikes, and often bring extras that they can try out. Our super-duty Mundo cargo bikes can carry riders weighing up to 400 lbs, and are safe and stable. It might help rekindle their long lost bicycle-love. With Rock the Bike you get experienced Sound guys and MC’s who are leaders in the green movement. Quit worrying about coordinating the sound guy, the DJ, the band, the iPod and the ‘groovy chill mix.’ Our team includes musicians who enjoy interacting with bands, are comfortable making announcements and MC’ing, as needed. We carry plenty of good music with us to keep the event moving during breaks. 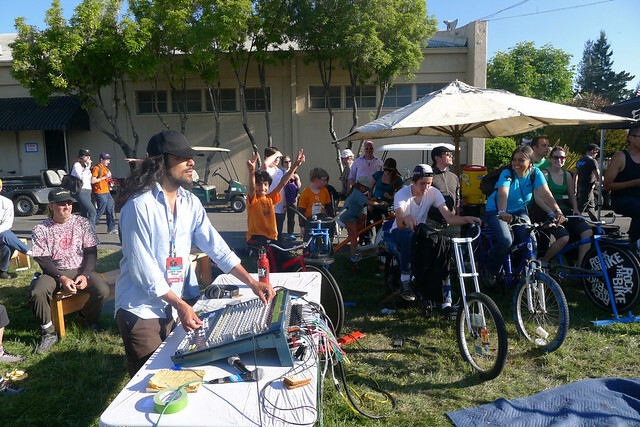 Rock the Bike team members have rocked the mic at events such as San Francisco Green Festival, Maker Faire, Bioneers, TED @ Vancouver, and other green/ alt-culture events. A Crew of Entertainers at Your Service. We make music, we enjoy music, we dance when we hear music. Rock the Bike crew members are fun-loving, and want your guests to have the best time possible at your event. Whether you want funky hip hop flava, an acrobat, or a full band we’ve got an array of assorted talents in our crew. Check our Music section to listen to some house bands, or ask us for recommendations. 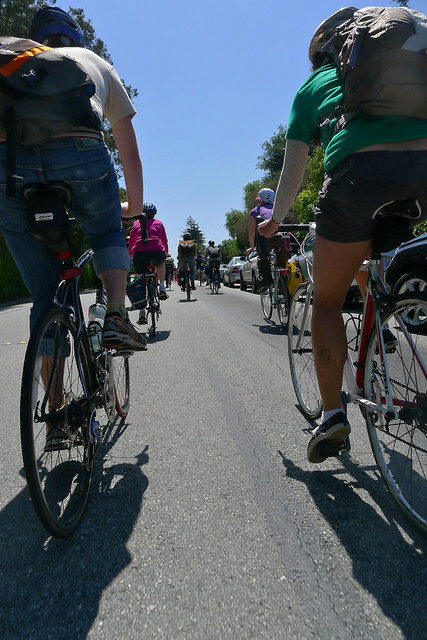 Up to 200 cyclists join us for the Annual Dolores Park t0 Maker Faire Social Ride. We want to help you mobilize your audience. Create excitement before your event begins by inviting your audience to join an exclusive Rock The Bike social cruiser ride out to your event. People will never forget cruising to your event next to their friends through the streets of San Francisco immersed in a cloud of glowing neon soul-cycles, Marvin Gaye bumping over the traffic noise, feeling high from the community spirit as people on the sidewalk clap their hands and cheer. Want to be part of the Pedal Powered Stage crew? Please get on our local events list by joining our Constant Contact newsletter. Look for “Email Address here” in the header above. Select “local events” as most of our events do not go out to our national list. Start coming to events and helping out. Thanks! *For speeches only, such as a conference, these crowd numbers are doubled. Please Be Advised: How many people that can hear your sound depends on the environment, type of music, amount of bass in music, and the amount of ambient noise. If you’re ready to begin planning your Pedal Powered Stage with us, please fill out this questionnaire about your event. Also, check out our other Pedal Power Activities you can rent.